The SEC’s Claims Review Staff (“CRS”) issued a Preliminary Determination granting an SEC whistleblower reward. Apparently the CRS imposed an SEC whistleblower award decrease due to what it determined was an unreasonable delay by the whistleblower in first reporting the fraud to the SEC. As a result, the percentage amount of the award was less than the maximum 30% allowed under the SEC whistleblower rules. The whistleblower appealed the Preliminary Determination to the Commission. In the appeal, the whistleblower requested an increase in his or her award percentage, arguing that the CRS had applied the SEC whistleblower award decrease too harshly. In its Order, the Commission denied the whistleblower’s appeal, and adopted the recommendations of the Preliminary Determination regarding the amount of the SEC whistleblower award decrease. 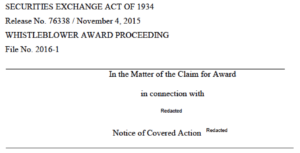 The Commission’s Order entered the award recommended by the Claims Review Staff. 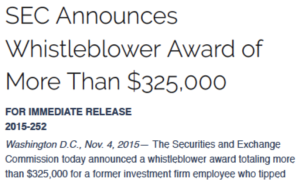 The SEC’s press release announcing the award clarified that the whistleblower was a former investment firm employee. In reporting to the SEC, the whistleblower provided the SEC with “specific information” including a “detailed description of the misconduct”. The whistleblower also “specifically identified individuals behind the wrongdoing”. However, the whistleblower waited until after leaving his or her employment with the investment firm before providing his or her information about the fraud to the SEC. … during the period of the delay, the violations continued and the respondents in the underlying action obtained additional ill-gotten gains, with a resulting increase in the monetary sanctions upon with the Claimant’s award is based. … because after becoming aware of the wrongdoing, [Redacted in original] did nothing to report the information and did nothing to try to stop the violations from continuing to occur, which under the facts and circumstances, we find unreasonable. According to a press release about the award, SEC “officials say the award could have been higher had this whistleblower not hesitated” in reporting to the Commission. In other words, had the whistleblower reported to the SEC promptly upon learning of the fraud, the amount of his or her reward might not have been subject to the SEC whistleblower award decrease for unreasonable delay. Whistleblowers are afforded significant incentives and protections under the Dodd-Frank Act and the SEC’s whistleblower program so they can feel secure about doing the right thing and immediately reporting an ongoing fraud rather than letting time pass. The Director also encouraged corporate insiders “to come forward without delay in order to prevent misconduct from continuing unabated while investors suffer more harm”. This award recognizes the value of the information and assistance provided by the whistleblower while underscoring the need for whistleblowers to report information to the agency expeditiously.